I wanted to get started on the lever cap so I cut a chunk of ½” x 2″ x 3″ steel, a 5/16″ rod for the cross pin and started layout. Then I measured the rod; way, way under size. Grumble, hardware store stuff isn’t so good, I’ll have to order some drill rod. So I decided to make the cap screw instead. Brass, which is a joy to work, I have no idea what alloy, I get it at the scrap yard. 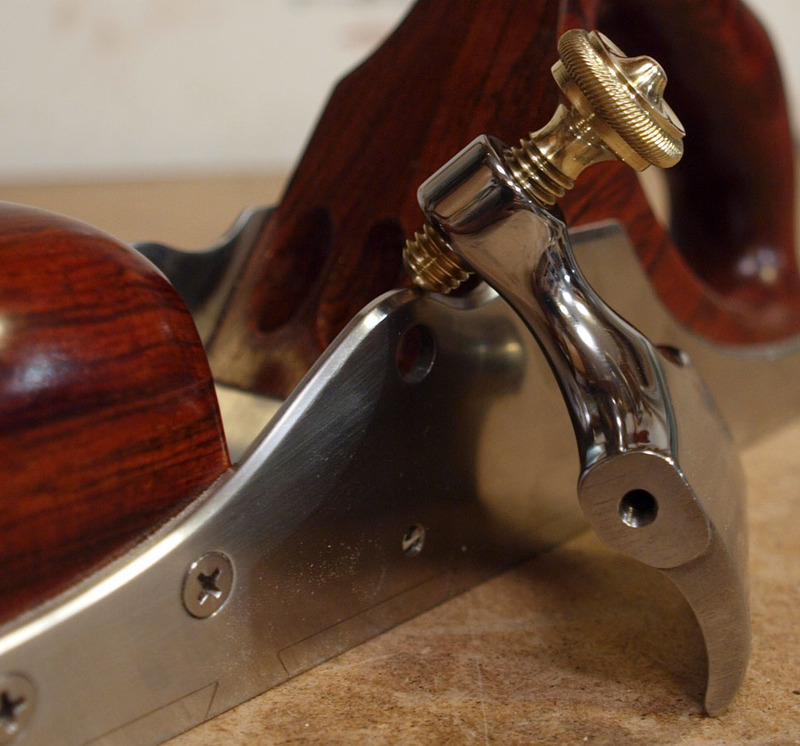 This started life as a 7/8″ rod, I really didn’t have a plan, just a vague idea of a couple of looks I wanted to copy. One was nut on the old school Starrett tool makers’ dividers (a classy tool) and the other was the neck from Karl Holtey’s cap screws. And a rope knurl. Which lead to a interesting discovery – scratch stocks for wood work great for brass. I wanted a 3/16″ or so “rope” but really didn’t want to try and form it free hand. So I took a hack saw blade, drilled out the hole to 3/16″, ground it down just over center and mounted it on top of a cutting tool blank. 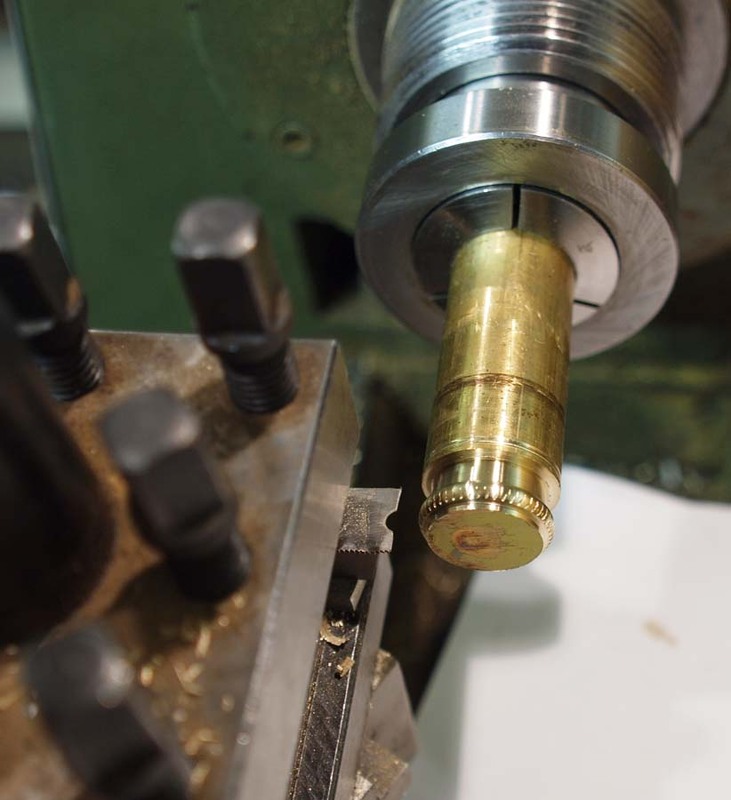 Turned on the lathe, stood back, slooooowly feed in the scratch stock, and waited for it to explode. It didn’t and worked great. For the top treatment, I really didn’t know what I wanted. Maybe a wood insert, or just a flat top. What I didn’t want was the saracen’s cap (cusp) you see on a lot of older infills. Ugh. Or so I thought. As I was poking at the top with a round lathe bit, the cusp kept wanting to pop out despite my best efforts to turn the handles in a different direction. Oh well, this is my take on that style and now I rather like it. 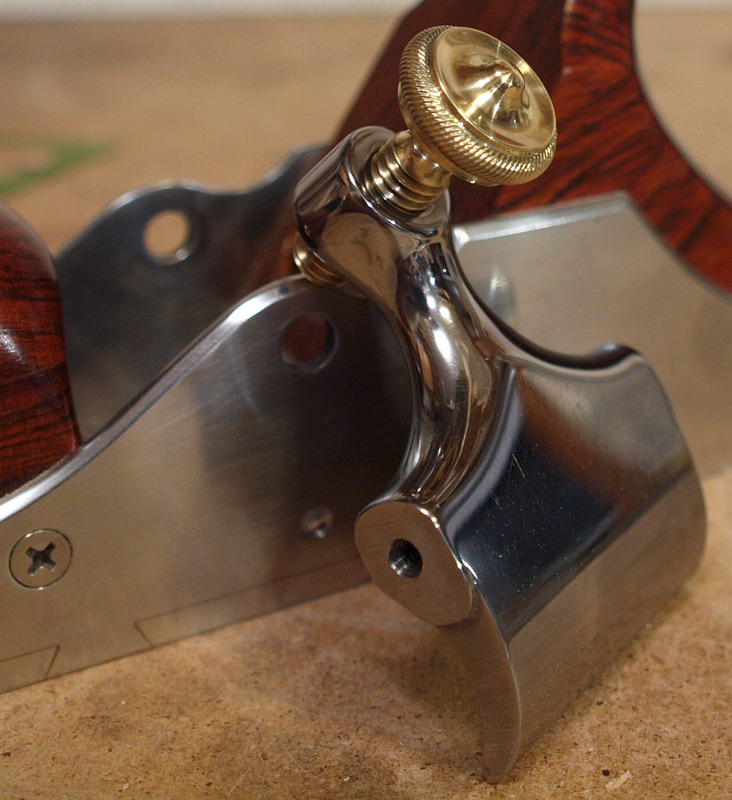 The lever cap and plane are from an older infill I made from stainless steel. This entry was posted in Planes: Smoothing. Bookmark the permalink. I enjoy your blog, especially your tool-making posts. For those of us not well informed about metal machining techniques, perhaps, at some future time, you could describe/show in more detail how to create that rope knurling. I can’t [visually] edit replies and I’m going to make lots of mistakes so I’ll do a short post.